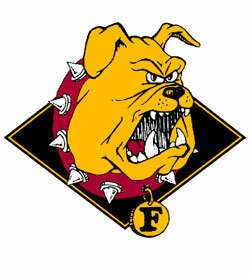 The Ferris State Bulldogs were a team of veterans in 2010-11. Much of that leadership is gone for the new season, and the ‘Dogs will hope for a fast recovery. Head Coach Bob Daniels (Michigan State class of 1982) will be celebrating his 20th year in Big Rapids. Daniels holds a 308-350-74 record in his 19 years, is 215-262-62 in CCHA play, and has led the Bulldogs to the NCAA tournament just once. Ferris State hosted the University Toronto in their season-opening exhibition and gave the Varsity Blues, well… the varsity blues, and whooped them 5-0. This past weekend, they traveled to St. Lawrence University where they beat the Saints 5-1 on Friday night and 4-2 on Saturday. In addition, Kyle Bonis was tabbed as the first week’s CCHA Offensive player of the week, with a 3-1–4 line on the weekend. Picked to finish T-7th by the CCHA Media and 9th by the Coaches, this year’s Bulldogs team will make the long journey to Fairbanks, Alaska for a series against the Nanooks. Because of that, they get the “bonus games” and will have 4 out of conference series this year. They’ve already swept St. Lawrence, will host RPI and Colgate in Big Rapids, and will travel to the Catamount Cup where they will take on RIT and host Vermont on their holiday tournament trip. Ferris State will join Northern Michigan, Alaska, Bowling Green and Lake Superior State in the reformed WCHA in a couple years, but for this year, will be fighting for a first round bye in the CCHA tournament with 7 freshmen on the roster. If you’re planning on a trip to Big Rapids this year, make sure to stop in to Schuberg’s Bar and Grill – the home of the Pabst-Mosa (yes, you read that right) and the Schuburger (Green olives on your burger? Yes, please!). You can thank me later. In Ferris State’s “Countdown to Faceoff” video series: Forwards, Defense, Goalies and Freshmen are featured. Columbus, Ohio (Dec. 11, 2009) – With all due respect to Red Bull, maybe their tagline should be revised. Junior captain Tommy Wingels netted #1 Miami’s first four goals including three on the powerplay as the RedHawks cruised past Ohio State 6-0. Wingels, who entered the game with six goals on the season, also added an assist for a final line of 4-1-5 enabling him to assume the team lead in goals (10) and forge a tie with junior forward Carter Camper for team points supremacy (18). It was Wingels first four-goal game of his college career and he couldn’t remember a time in recent history that he’d had a similar performance. Three other RedHawks enjoyed three point evenings as Camper (0-3-3), junior forward Pat Cannone (1-2-3) and freshman forward Curtis McKenzie (0-3-3) helped set up Wingels and senior Jarod Palmer who scored the sixth and final goal of the night for Miami at 15:49 of the third period. Lost among the offensive fireworks was the solid defensive job Miami was doing in holding the Buckeyes to just 17 shots on goal. The team effort enabled sophomore goaltender Cody Reichard to notch his second consecutive shutout and lower his nation’s best goals-against average to 1.34 as he improved to 10-1-2 on the season. Miami has not allowed a goal since November 28 as they have recorded shutout victories in their last three games. In fact, the scoreless streak has now reached 202:14 minutes which is a school record. For the Buckeyes, the loss had to be disheartening as head coach John Markell thought he was settling in on a starting goaltender in sophomore Cal Heeter that he could ride during the second half of the season. Heeter came into Friday’s game with a 2.75 GAA and 91.4 save percentage. However, the native of St. Louis, Missouri was average at best surrendering all six Miami goals and perhaps had a case of the jitters. With the performance, Heeter earned himself a spot on the bench for tonight’s series finale in Oxford. Junior goaltender Dustin Carlson will apparently return to the Buckeye crease to face the always creative Miami student section in Steve Cady Arena. With the win, Miami improved to 12-2-5 on the season and 9-1-3-1 (31 points) in the CCHA. Miami will need to continue to win as both Michigan State (26 points) and red hot Ferris State (25 points, two games in-hand) continued to post league W’s and are in the RedHawks rear view mirror for the top spot in the conference. Ohio State will be looking for a better effort in tonight’s rematch in Oxford as they saw their record drop to 7-11-1 overall and 5-7-1-1 in the league. The Buckeyes’ 17 points is good enough for 8th place and the final home ice slot if the CCHA playoffs began today. Reichard’s shutout was his third on the season which is a new career high. Last year, Reichard posted two shutouts during a stellar freshman season. Given the winter break begins after tonight’s game, it will be interesting to see if Miami coach Enrico Blasi goes with his typical Saturday goaltender (sophomore Connor Knapp) or if he goes with the red-hot Cody Reichard as this is the final league game for about a month, and as such, is very important for Miami. Wingels is just five goals behind his career high of 15 that was established during his freshman season with more than 18 games to play. He has responded both on and off the ice in his new role as RedHawk captain. Camper recorded the 100th point of his career with his assist on Wingels’ second goal. The Buckeyes have been shutout three times this season and are averaging just 2.31 goals per game. Miami was 4 for 6 on the powerplay while Ohio State was 0 for 6. Miami has now successfully killed 23 consecutive opponent powerplays and Ohio State has not converted in their last 24 man advantage situations. Heeter made 27 stops as the RedHawks outshot the Buckeyes 33-17. A pro-Miami crowd of 4,496 was in attendance at Value City Arena. Tonight’s game will be televised live across the great state of Ohio on ONN at 7pm. Miami leads the all-time series 41-38-12 against Ferris State including a 21-19-4 record in Oxford. Last season, it was the Bulldogs that swept the Red and White in Big Rapids, Mich., (6-5 on Feb. 15; 3-1 on Feb. 16) which likely kept Miami from the CCHA regular season title. Over the last 10 match-ups between the two schools, Miami holds a record of 6-3-1. Miami has never lost to Ferris State in Steve Cady Arena and has not lost to the Bulldogs in Oxford since Dec. 11, 2004. Jarod Palmer reached the 70-point plateau Nov. 1 against Alaska as he picked up the first assist on Carter Camper’s shorthanded goal in the third period. Brian Kaufman also picked up point number 70 for his career Nov. 1 against Alaska. The senior captain was credited with the second assist on the first goal of the game by Camper. Miami now has three active players with 70 or more career points (Kaufman, Palmer, and Justin Mercier, 79). Carter Camper and Pat Cannone are currently tied for the team lead in points with 12. Camper has been hot on the power play as he has a national best 10 points, with the man advantage. Camper (3-7-10) also leads the conference in overall power-play points and he and Cannone (2-4-6) are the only players in the CCHA with more than five points on the power play. With his assist on Oct. 31, Camper became the fourth-fastest RedHawk to 50 points in the CCHA era. Cannone currently leads the team in points in conference with 11 and has recorded nine of those points in Miami’s three home games. Connor Knapp earned his first career shutout as he blanked Alaska 5-0 on Nov. 1. Knapp is part of a dual threat for Miami in the net with fellow freshmen Cody Reichard. Together the two have helped Miami to a 2.08 goals against average and a 1.64 goals against average in conference play. Knapp is undefeated and untied in conference play with a 3-0-0 mark. Reichard holds a record of 1-1-1 in CCHA play with 77 saves against conference foes. Knapp has also made two saves this season on penalty shots. Andy Miele got off to a slow start in the 2008-09 campaign but has come on strong in the last two series’. Over his last four games Miele has scored two goals, dished out three assists and earned the CCHA offensive play of the week honor on Oct. 27. He racked up three points against then-No.7 Notre Dame in the Joyce Center (Oct. 24-25) as the RedHawks swept the Fighting Irish. Miele earned his first goal of the season against Alaska as he found the net at 12:20 of the first period on Nov. 1. Miele would strike again in the third period giving him two goals on the night, tying his career high for goals in a game. Trent Vogelhuber made his first career appearance for the Red and White as he was in the starting line-up for the RedHawks on Nov. 1 against Alaska. Vogelhuber was a seventh-round pick of the Columbus Blue Jackets in 2007. Since allowing a 5-on-4 goal on its first penalty kill attempt of the season Miami has not allowed another single man-advantage goal on the campaign. Miami has also killed off 36 consecutive power plays including going 10-for-10 against Alaska on Nov. 1. Miami currently leads the CCHA on the penalty kill as it has stopped opponents on 96 percent (52-54) of their power-play chances. This gives Miami the third-best penalty-kill unit in the nation. Miami has been one of the top teams in the CCHA in offense in 2008-09. Miami has been led by Pat Cannone and Carter Camper, who both have 12 points on the season. Seventeen different RedHawks have recorded a point on the season and 10 different members of the Red and White have a goal this season. Of the 10 players with a goal only one, Brian Kaufman, has one the remaining nine all have at least two on the campaign. Gary Steffes has been the biggest offensive surprise as he posted 11 goals in his first two seasons with the RedHawks and has five in the first eight games of his junior year. Camper has been on a tear on the power play as he leads the nation in power-play points with 10 and has 11 points on special team (one shorthanded goal).